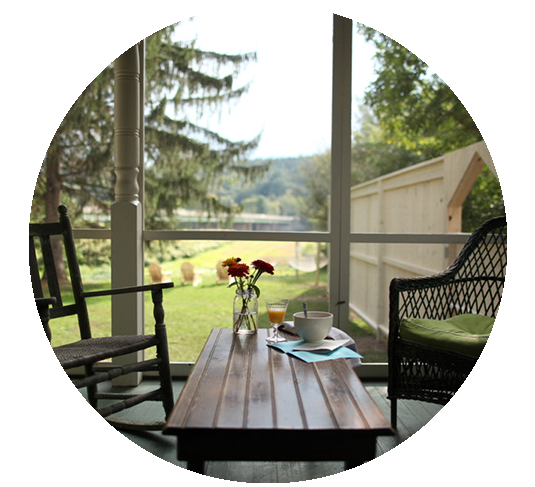 Nine River Road is an eight room riverside retreat nestled on the Delaware River in the town of Callicoon. Built in 1884, and formerly housing the Milwaukee Furniture store, Nine River Road now invites guests to experience all the best things about life on the river. Take a short walk to Main Street to discover antique and home decor shops, art galleries, a great selection of places to eat, and Sullivan County’s only movie theatre. Catch live music and share a drink with the locals, or pick up some wine and cheese for a private riverside picnic in the Summer or cozy up by the wood stove the in Winter. Stop by the farmer’s market to take a little piece of this place back home with you.